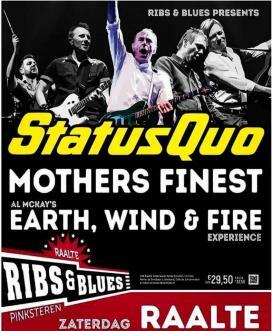 Main Setlist UK 2017: Caroline, Somethin' Bout You Baby I Like (with Rhino voc), Rain (Rhino voc), Little Lady (Richie voc), Softer Ride, Beginning of the End, Hold You Back, QUO Medley incl. What You're Proposin' / Down The Dustpipe / Wild Side of life / Railroad / Again and Again (Rhino voc) / Paper Plane, The Oriental, Creepin' Up On You, Don't Drive My Car (Andy voc), In The Army Now, Roll over lay Down, Down Down, Whatever You Want (Andy voc), Rockin'all over the World, Burning Bridges, Rock and Roll Music (Rhino voc) / Bye Bye Johnny. Main Setlist Summer 2018: Caroline, Somethin' Bout You Baby I Like (with Rhino voc), Rain (Rhino voc), Little Lady (Richie voc), Softer Ride, Hold You Back, QUO Medley incl. What You're Proposin' / Down The Dustpipe / Wild Side of life / Railroad / Again and Again (Rhino voc), Big Fat Mama (Richie voc), The Oriental, Beginning of the End, In The Army Now, Roll over lay Down, Down Down, Whatever You Want (Andy voc), Rockin'all over the World, Bye Bye Johnny. Tour Crew: Glen Smith (Tour Manager), Lyane Ngan (Band Personal Assistant), Ewan Cameron (Lightning Director), Andy May (FOH Sound Engineer), Tim Franklin and Danny Stead (Monitor Engineer), Lloyd Gilbert (Guitar Tech/Stage Manager), Andy Tomkins (Keyboard / Bass & Guitar Tech), Lance Miles -substitutes for Lance: Darren Alexander, Benny Calvert- (Drum Tech), Tanja Buck (Production Assistant), Alan "Tonto" Jhowry (Guitar Tech - helping out in August 2018). Tour Notes: Live Here Now are recording the show at Reading Hexagon 30/11/17. The recording will be available as a Double Deluxe CD (£20) and for download (£10). 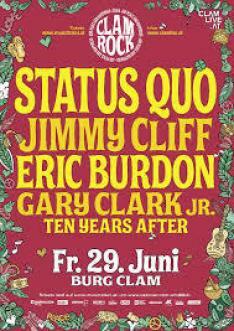 *Status Quo is very special guest on all dates at Lynyrd Skynyrd's Farewell UK Arena Tour 2019. 22/06/ POLAND - Wroclaw - Stadium Olimpijski "Eleven Bike Fest 2918"
This only applies to the UK dates - running from 26th Nov in Manchester through to 8th Dec at London's Eventim Apollo in Hammersmith. 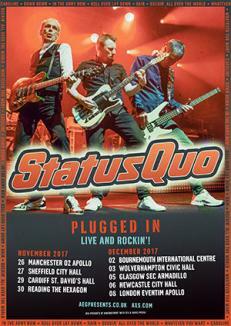 Previously announced European dates for November and December will be Aquostic. And it’s the fans that have prompted yet another change. 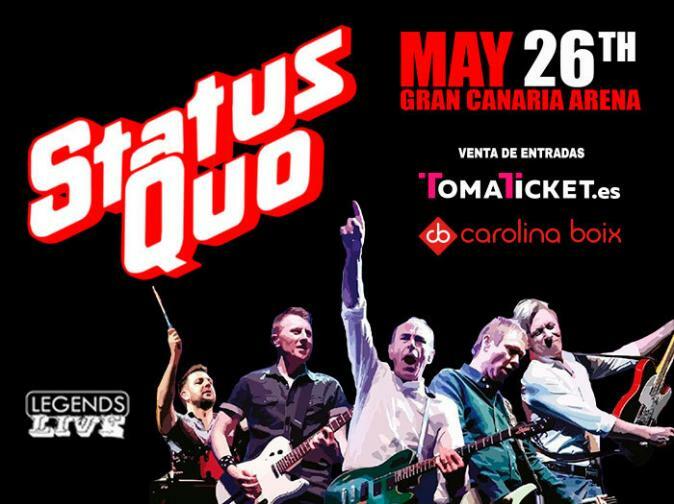 In late April the band announced their long-planned 'Aquostic' tour of the UK and immediately found themselves with a dilemma. The shift to 'Aquostic' tour had been deemed necessary as the inevitable rigours of the Electric set were considered to be too much for Rick to take on. Yet demand from fans for Electric shows was undiminished. 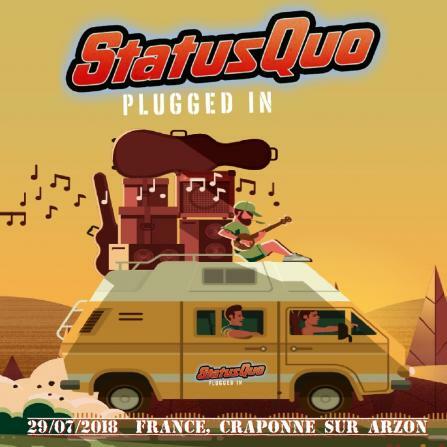 Taking into account all changed circumstances, and the band's movement out of the cycle of the successful 'Aquostic' albums, a decision has been made to plug back in. 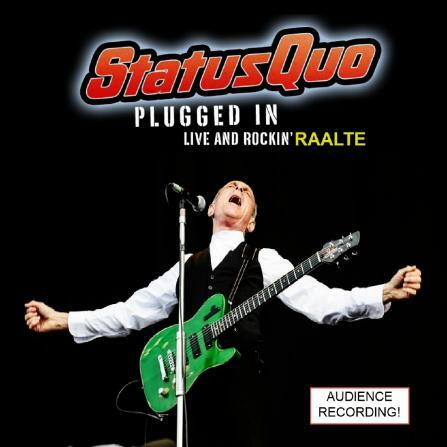 The renamed 'PLUGGED IN – Live and Rockin!' tour will now be fully Electric. This change applies to UK dates only. 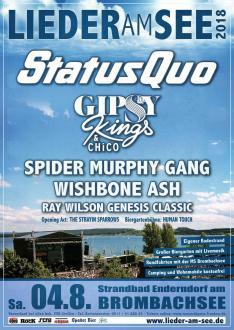 The band have not toured the 'Aquostic' show in Europe and promoters have requested that the shows stay in that format. Francis Rossi said, "This has been a year like no other. In many ways the band has felt out of control. Rick's passing was a huge blow. Much of what we had planned was envisaged initially to accommodate what would be right for him; those sands have obviously shifted. Now everything has changed. The band is not the same - it can't be and shouldn't be – and the plan has changed too. We're still listening to the fans, we always have, and we’re hearing that this is what they still want. We’re going to give it to them". 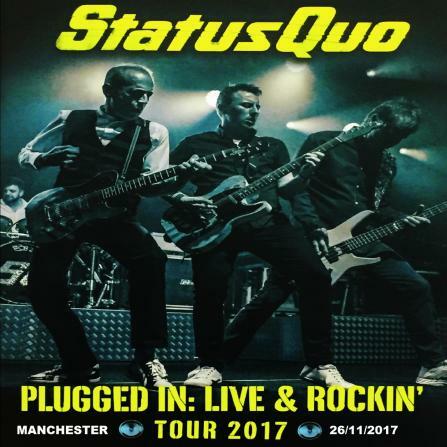 12.10.2017 - Press Release: Status Quo have announced that the band are to radically cut back on their touring activities and will only perform a series of summer shows and festivals during 2018. 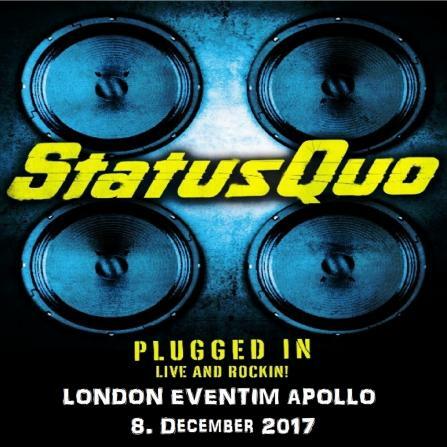 For the first time in around thirty years there will be no traditional Quo winter tour of Europe or Christmas shows in the UK. 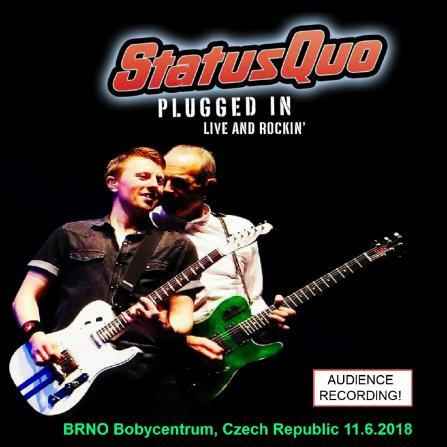 As a result, the show already announced for November 3rd 2018 at the massive Hallenstadion in Zürich has been rescheduled for October 6th 2018 and will be the final Quo gig of the year. All tickets for the original date will be valid for the new date and ticket holders do not need to take any further action. 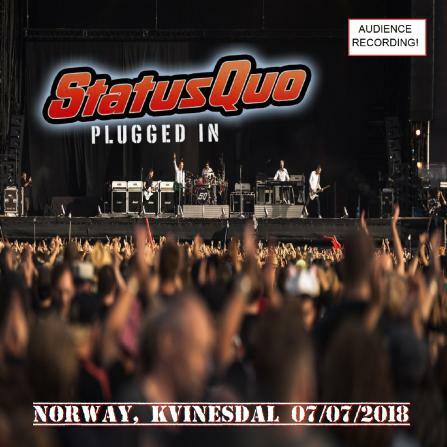 Thus, the forthcoming Australian tour and the ‘Plugged In: Live and Rockin’!’ UK Tour will be the only opportunity for fans to see the band in smaller and more intimate venues for at least two years. 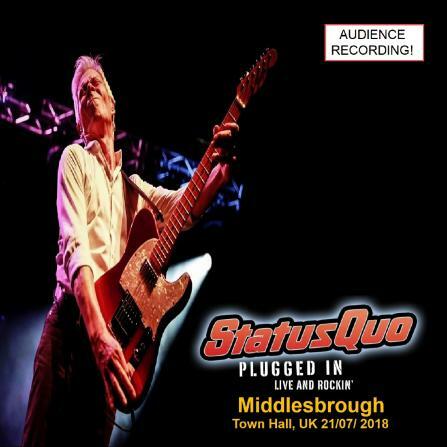 Additionally, as a tribute to the late Rick Parfitt, the Quo setlist at these dates will now include two of his best-loved classics, Don’t Drive My Car and Little Lady. 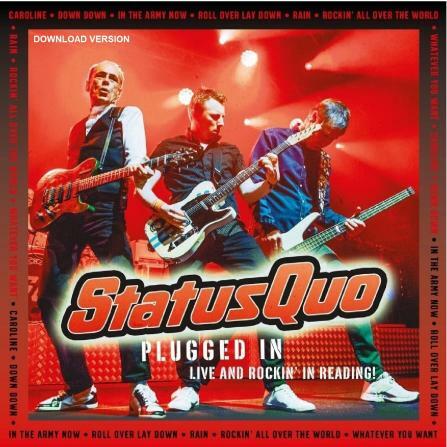 Comments Francis Rossi, “This year has been one of change and reassessment following the sad death of Rick Parfitt. Although Rick had already retired from touring for six months before he died, it was still a major shock and my immediate reaction was to honour existing contracts and then knock it on the head. 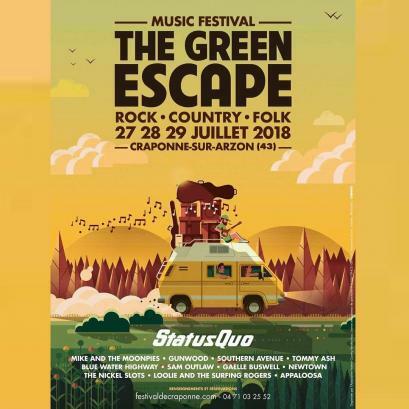 However, since then I have become increasingly confused as I realized just how much I was enjoying touring with two vibrant young guys in the band in guitarist Richie Mallone and drummer Leon Cave. They have given us old guys a good kick up the backside and whilst it could never be the same as with Rick in the band, it is different now but in an exciting and vibrant way that I can’t fully explain. 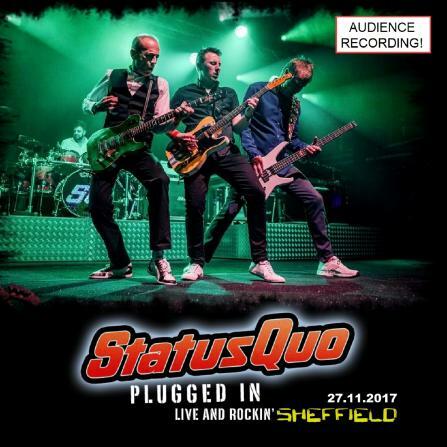 The 2017 gigs have been absolutely incredible and spirits are high, but we do now need some thinking time to consider all of the options now on offer for 2019, which could well include the recording a new full on Quo rock album! We would love as many fans as possible to come and really help us make some noise on this year’s dates as we definitely won’t be touring in 2018. 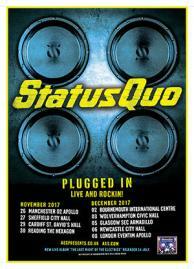 This is a massive change for us, and I know that the Quo tour has become a traditional part of the festive season for many fans”. 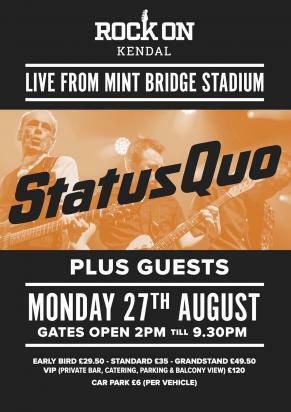 Status Quo have performed well over 6000 live shows in the career, travelled millions of miles, entertained tens of millions of fans and spent nearly a quarter of a century on the road and away from home. It’s time to take stock. The Winter Tour of 2017 is not a farewell but it will be the last time to see this legendary act touring the UK in their traditional manner for the immediate future. 26.01.2018 - A private show in Northern Ireland. 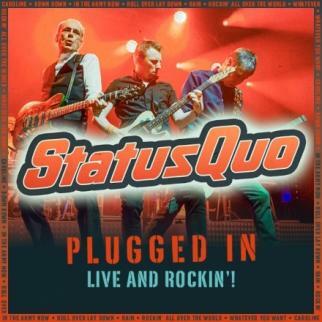 The Belfast Telegraph reports on a father and daughter who know how to party, The paper reports that legendary rockers Status Quo flew to County Down to play a surprise birthday gig for one of Northern Ireland's top businessmen and his daughter. 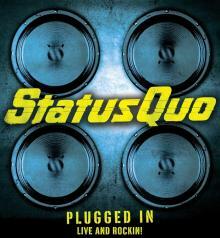 Status Quo performed at the birthday party of the year at the Culloden Hotel near Belfast, Northern Ireland. The paper says Leslie Hughes, who founded Hughes Insurance and his daughter Nicola Thompson's birthday at the Culloden hotel was quite the shindig. As well as Status Quo, comedian Rory Bremner also performed on the evening, posting a picture of the band in full swing.